Released: 1992. Genre: 2D beat 'em up. Other versions: SMD; AMI; AST; PC. In the aeons of video gaming, there are very few titles that can be acclaimed as ‘legendary’. Many games can be branded as outstanding, groundbreaking or memorable, but it takes something indescribably special for any single title to achieve such a status of high fame and universal praise. In 1991, one such title appeared in the arcades around the world that was to kick-start one of the most acknowledged franchises in all of gaming. 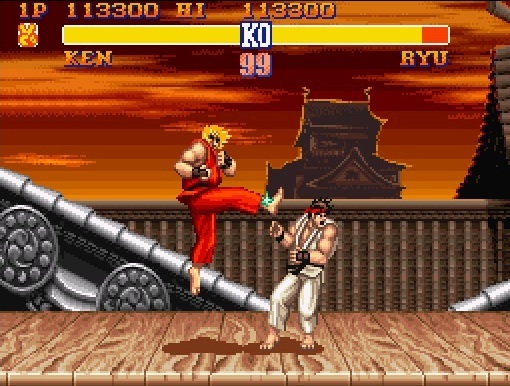 Nintendo scored a coup over their rivals in 1992, securing the first console port of Street Fighter II: The World Warrior, suitability showcasing the Super Nintendo’s power and popularity. In the first previews, the most regurgitated line in the magazines would be that of ‘arcade perfect’, a slight exaggeration, but not too far off the truth. 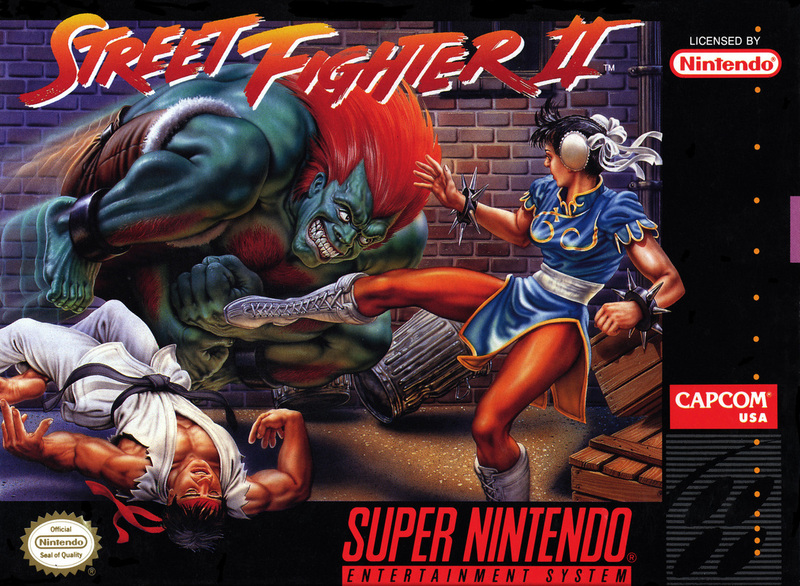 The SNES version of Street Fighter II was one of the first blocks in the giant staircase that Capcom was to build around Ryu, Blanka and company. The series has faltered with several poorly-conceived sequels, drawing further away from the primary hook, whilst the original still stands the test of time today. Along with it’s many other quality attributes, it possesses that elusive X-factor that makes it the ‘legendary’ game it is and will be forever more. For those who have been living in an underground cave wearing a bag for the last 20 years, Street Fighter II is a one-on-one beat ‘em up, a genre that would become very popular hereafter. 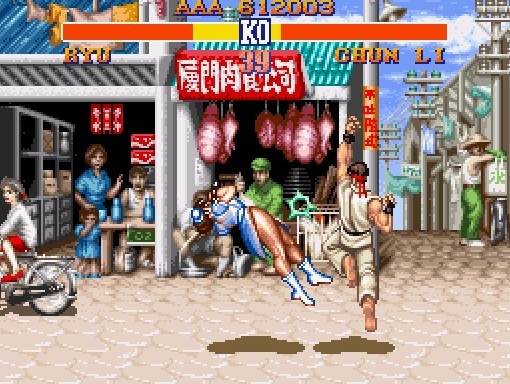 At the time, this was not all that common, with titles like Hippodrome, Yie Ar Kung-Fu and its own predecessor Street Fighter being the only name-worthy titles. What makes Street Fighter II stand out can be attributed to many key developments in gameplay over these early arcade titles, and can arguably be lauded as the blueprint of the modern fighting game. 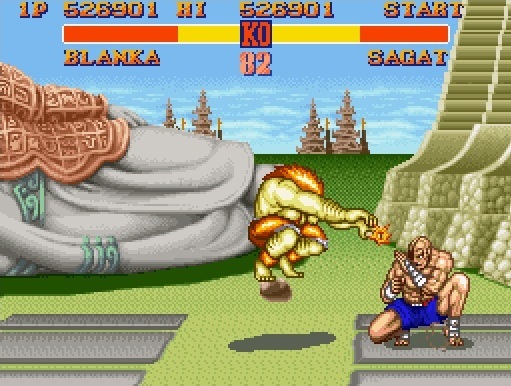 It pioneered the use of multiple playable characters, basic storylines you could attach too, catchy and memorable BGM, but mostly the range of moves, techniques and combinations at the player’s disposal. The arcade version single-handedly sparked a resurgence in coin-ops during the early nineties, with a spate of games like Mortal Kombat and Primal Rage following in its wake. The Super Nintendo’s port was always surrounded with hype; it was to be the first 16MB cartridge, would sport a hefty price tag but, more importantly, be heralded as a 16-bit title that was as close to the arcade as possible. For the most part, it is an extremely faithful reproduction of the original, even with some simplification to the graphics and the re-arranging of the audio. The core gameplay, physics and responses remain exactly intact, and results in a game of sheer excellence. On first play, more casual arcade gamers did mistake it as exactly the same. However, more intuitive players did spot the differences. Most obviously, the title intro sequence is missing (something the Mega Drive’s Champion Edition would restore). The music has been simplified a touch, producing a more flat and grainy tone. The basic compositions are identical however, and some versions of the stages BGM are actually better than the arcades (Bison’s and Chun-Li’s for example). All the hits, thumps, groans, slaps and shouts are the same, with only a few speech samples missing from the select screen and continue countdown, the SFX are again spot on. The small differences are really not that noticeable, because all the sounds integral to the gameplay are present, and the production and balance is also quite impeccable. With the sounds reproduced to a high degree, the graphics also follow along the same lines. A slight trimming of bits and pieces here and there, most of these abridgments are hard to spot save for alterations to the bonus stages, but this aside all the important graphical elements remain. All the character animations are wonderful and fluid, the colours are bold, bright and distinguished, whilst all the little quirky touches are also present. The end poses, the special moves, the dizzy stances etc. The backgrounds are animated to a lesser degree, but drawn and coloured as well as the sprites. With some components removed to help the SNES hardware cope, they are still all rather first-class, including the breakable barrels and crates for a fighter to smash into. Even the cheeky visual euphemisms are in there, seemingly performing some suspicious movements whilst watching the action (check out the Airman on a crate in Guile’s stage!). All of the stages are packed with detail, liveliness and fun, the characters always the focus of it, seamlessly fitting together and all presented in top-class fashion, with very little blocky-ness and no hint of layer overlap glitches. "What I wouldn't give to be twenty years younger... And a woman!" Street Fighter II’s masterstroke is its fundamental and extensive gameplay; with eight characters to chose from, 7 with entirely different move sets featuring many diverse moves, over 30 in most cases. Chuck into this 4 difficult boss characters (Well okay, 3. 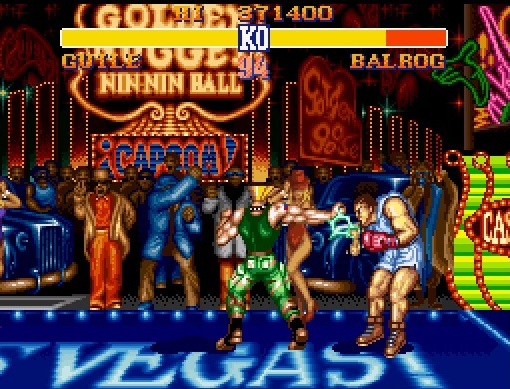 Balrog is piss-easy) in 12 different locations and this makes for a whole lot of game. Not only that, SF2 was one of the first to exploit combination moves, something of which is commonplace now. These have to be discovered through trial and error and adds yet more depth and intrigue to the game. It’s possible that there are over 100 different combinations altogether, and even now I stumble across something that I have never done before, and I rate myself pretty handy at this game. There is something magical about the balance of moves each fighter possesses that makes each one extremely playable in entirely unique ways. Beginners can easily get to grips with standard skill sets from Ken and Ryu (hence why both have the same moves, you can’t play as the same character), but more progressive players can achieve spectacular results from some of the more awkward characters like Dhalsim, Zangief or E. Honda. The balance of this is terrific, and doesn’t deter the player from trying all the fighters, finding out which one is suited to their style of playing. 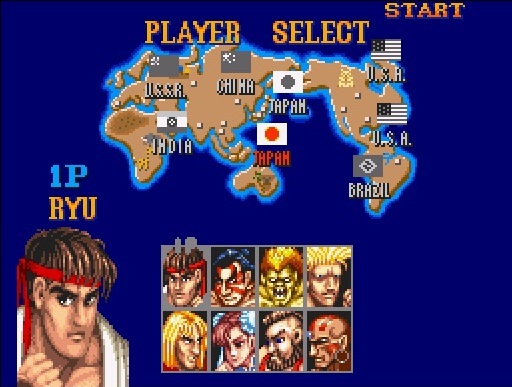 This is where I believe Street Fighter II has the edge; the sheer range and styles of characters and their moves, all equally as dangerous as each other in the right hands. For me, titles since have been ‘over-egged’, lumping lots of poorly- designed characters just to add more selection options and trying to show-off too much with the graphics. I sincerely dislike bullet-time in fighting games, as well as daft and unnecessary captions and effects flashing up all over the place. This game has all the basics in exquisite harmony to give you an awesome and skilful fighting experience without being so brash and loud. The SNES adaptation of this Capcom Hall-of-Famer is probably one of the finest arcade-to-console ports in history, and was yet another title to build up the Super Nintendo as one of the all-time top games machines. The controls are alert and refined, the 6-button controller configuration aiding this a great deal, the pace is solid and consistent, and the difficulty curve right on the money. No, visually and acoustically it is not arcade perfect, but it does have all the required elements that made the coin-op the grand-daddy of beat ‘em ups. Honestly, even looking and playing it now it’s still a very fine game to look at, listen to and, of course, utterly awesome to play. 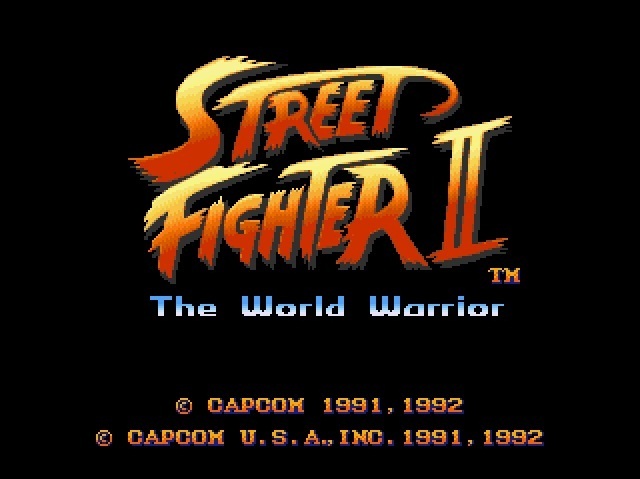 Apart from its own updates such as Champion Edition, Hyper Fighting/Turbo and (to a lesser extent) Super SF2, The World Warrior is still the best one-on-one 2D beater in its purest form. It’s sequels after these versions lost the magic in my view. In fact, it even stands up well against some of the best 3D brawlers like Tekken or Soul Calibur. Undoubtedly all Super Nintendo collectors WILL have this in their collection, as it is without question one of the most unrivalled and most playable titles ever released. It’s a major part of video game history; one of the very few elite. Now, all together… Hadouken!